Will the real "mini" please stand up? This could be you, One mini 2, as you right all wrongs with the previous One mini edition. HTC's munchkin might have a midrange silicon, but there is now a microSD slot housed inside that prime aluminum chassis, a larger display, and a 13 MP camera on the back that is worth its salt. Add to these the BoomSound stereo speakers, a larger, 4.5" display, 5 MP wide field of view camera in the front, plus a well-sized battery, and the shrunken One is ready to pique your interest. 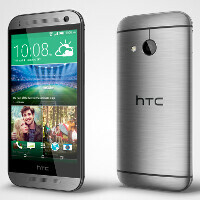 The HTC One mini 2 will be available in Gunmetal Gray, Glacial Silver and Amber Gold in European, Middle Eastern, African and Asia Pacific countries from June, while the North American release is yet to be commented on. The exact price of the One mini 2 will inevitably vary by market, but the midranger shouldn't be hovering much above the 400 USD/EUR or £250-300 mark without subsidies, if it wants to stay in the game, as the Xperia Z1 Compact would quickly eat its breakfast then. Granted, we had the HTC One mini 2 preorder pricing leaked out by two Finnish online retailers, revealing a steep price tag, but the Scandinavian region is pretty puffed up when it comes to tech costs, plus those preorder tags are often rather inflated and misleading, feeding on the early adopter frenzy. We are now getting reports (thanks, Timon) that the One mini 2 price in the Netherlands has actually been pegged at €469 already, including the value-added tax, so the aluminum munchkin might be breaking the 450 USD or EUR barrier after all, which would put it against some formidable competition. It's certainly getting more brutal in that price range, especially after One Plus joining the fray (Despite their controversial invite stunt). With those specs anything over 300 Euros is a rip off. I would get the M8. If you can wait a little longer, you should hold out for the M8 Prime! Going to be a beast like the M8, but bigger screen and battery!